Some of the most exciting new boats in recent years have come out of the 40-foot range and the Jeanneau 409 may be at the top of the heap. The Phillipe Briand design has the European style that is common to Jeanneaus with a very up-to-date hard-chine hull form. A low cabinhouse and well-sized sailplan give the boat a sleek look without sacrificing interior volume. The cockpit is set up with a nod toward short-handed sailing. All of the halyards are led back to the cockpit under the coachroof and the boat is outfitted with Harken's new Rewind Radial Electric winches, which allow a sheet to be trimmed or eased with the push of a button, without removing it from the self-tailer. Double steering wheels bridge the gap of the wide cockpit and a fold-down swim platform offers easy access to dinghies and the water. With the wheels pushed back, there is plenty of room in the cockpit for lounging. There are multiple interior layouts available, including two-cabin and three-cabin options. All include a V-berth forward and a U-shaped settee the turns into a double berth. Two aft cabins or an aft cabin with a storage are offered. A good-sized galley is common to all layouts. The rig is fractional and again multiple options are available for the sail plan. 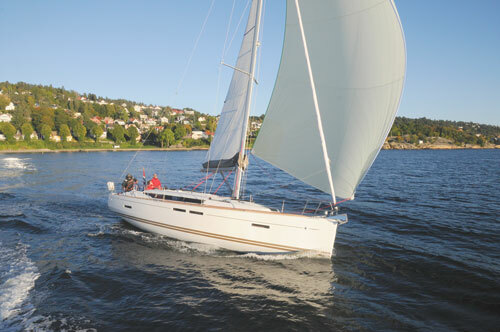 A performance package offers additional genoa tracks for use with overlapping headsails and a self-tacking jib is also an option. With a high level of customizibilty for a production boat, the 409 should be a good fit for a lot of sailors, particularly those who are looking for a nice crossover between performance and cruising. LOA 40'; LWL 36'1"; Beam 13'; Displ. 16,390 lbs. ; Draft standard 5', deep 6'10"; Sail Area 849 sq. ft.; Auxiliary 40-hp sail drive; Fuel 53 gal. ; Water 140 gal.